Here’s what the SP cards look like all lined up next to each other. Couldn’t get them to line up exactly perfect, but they still make a nice complete picture. There’s one thing we have been neglecting to show you however, and that’s the back of the cards! We’ll be looking at them today. 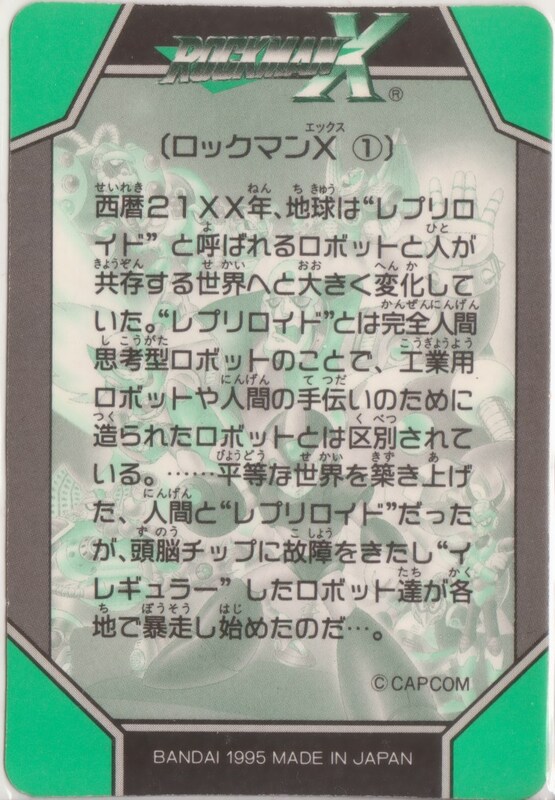 They tell the backstory of X1 and X2, and much of the text is adapted from some of the other cards from the regular Rockman X and Rockman X2 card backs. There are also some interesting discrepancies and differences from the games, which we’ll talk about as well. In the year 21XX A.D., the planet has undergone a drastic change, to a world where humans and the robots called “REPLIROIDS” live in coexistence. Different from the industrial robots and the robots created to assist mankind in the past, a “REPLIROID” is a robot with the complete capability of human reasoning. SP-1 tells a condensed version of the story that appears in Rockman X Carddas cards 2-4, while SP-2 below recaps cards 4-5. 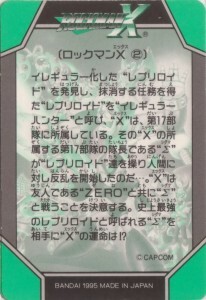 “X” is a member of Unit 17 of what is called the “IRREGULAR HUNTERS”, “REPLIROIDS” whose duty is to detect and delete any “REPLIROID” who goes irregular. 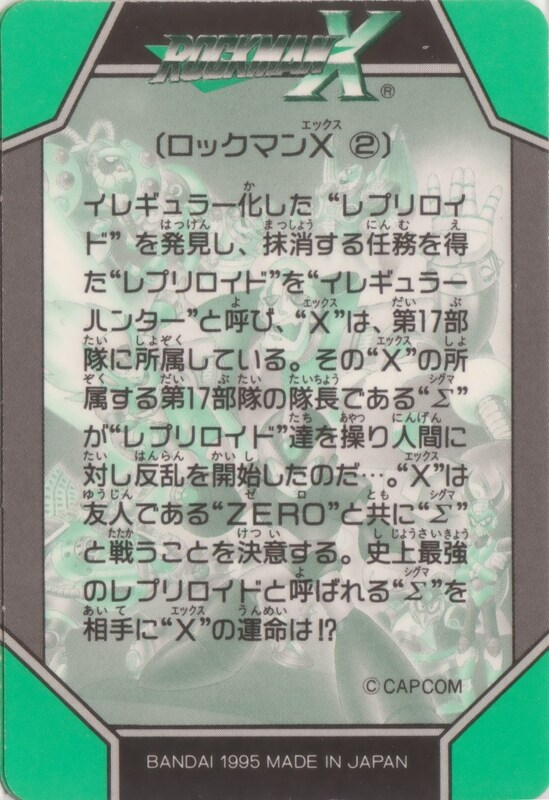 The Commander of X’s 17th Unit, “SIGMA”, has instigated the “REPLIROIDS” into initiating an uprising against humanity… “X” decides to join his compatriot “ZERO” in the fight against “SIGMA”. In opposing “SIGMA” who is renown as history’s mightiest repliroid, what will be the fate of “X”!? Next, SP-3 summarizes the story from Carddas’ Rockman X2 cards 44-45. By they way, I apologize for the annoying overuse of quotation marks and capitalization in these. I decided to leave the notation similar to what the cards used, even though it looks a little awkward. At least it’s authentic awkwardness. 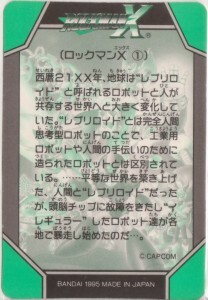 Finally, SP-4 contains the story that appears on card 48 of the regular X2 line. While SP-4 may contain a glaring error unique to itself, both cards are noteworthy for being at odds with what occurs within the game Rockman X2. “X” returned to Hunter HQ after neutralizing the secret manufacturing facility of the “IRREGULAR HUNTERS”, only to discover that the headquarters had been ruthlessly invaded. Narrowly surviving the attack, “DR. 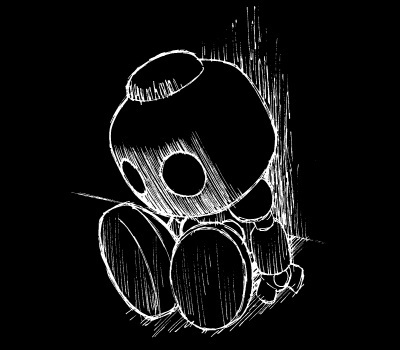 CAIN” was able to inform him that a group calling themselves the “COUNTER HUNTERS” were the one behind the mysterious raids, and had stolen the control chip of “ZERO”. Believing that “Sigma” must somehow be connected to these incidents, “X” is determined to fight and recover “ZERO”‘s control chip. The next battle between “X” and “SIGMA” begins!! The first questionable item in this passage was calling the factory a secret Irregular Hunter facility. This was not something that was said in the initial cards, or anywhere else that I know of. Many fans believe this to be a writing error, and that was either meant to say “IRREGULAR” or “COUNTER HUNTER”. On the other hand, to those who appreciate elaborate fan theories, there are some who suggest that Sigma may have had the factory built for his own evil purposes while he was still a Hunter leader, and classified the project so that practically no one in the organization knew about it; thus making it a secret Irregular Hunter manufacturing facility that produces Irregulars. There’s little to support or debunk the claim, so why not decide for yourself which explanation you find most suitable. 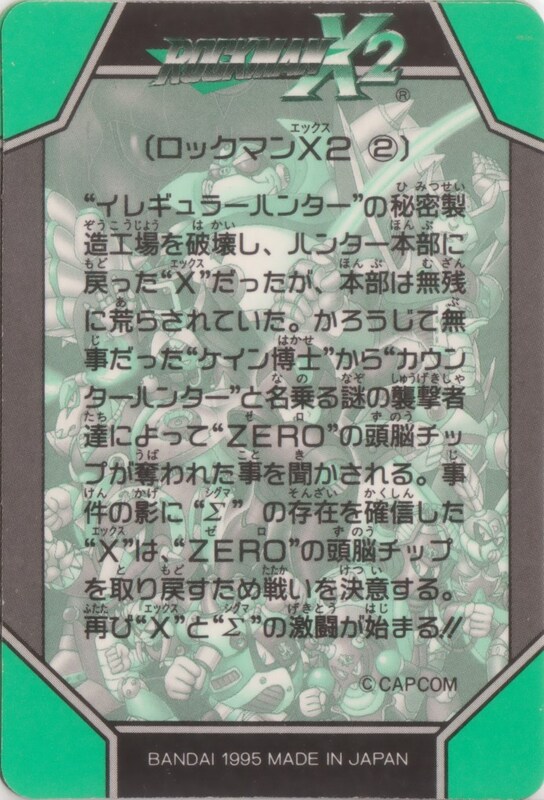 The other oddity from this passage, which was also found on Rockman X2 card 48, was the part about the Counter Hunter attack occurring while X is fighting at the factory, and the Counter Hunters taking Zero’s control chip this early in the story. You may remember that in the game, the Counter Hunters (or X-Hunters) don’t directly contact X until after he’s beaten two of the Irregular (or Maverick) bosses, then informing him that they have Zero’s body parts. At that point, Cain assures X that Zero’s control chip is still held at the HQ. It is only if X fails to acquire all of Zero’s parts from the Counter Hunters that the base is attacked and the control chip is stolen. So, why the disparity? 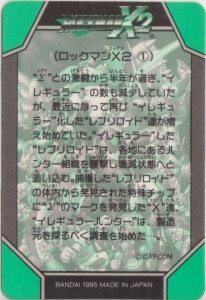 When the X2 cards first came out, some fans believed that this could have been a story element that was changed in development between when the cards were made and the game was finalized, assuming that the cards were in production at the same time as the game, and miscommunications may occur. As still others have noted, the event described in the cards does match pretty closely the scene that occurs in the game, just not at the right time. It could be that because the cards are providing only a loose summary of events, they might have skipped around to tell only the most important story facts. In other words, X fights the factory battle, and the other stage battles, and only later does he return and that scene plays out. It’s only condensed for the sake of being a recap. And then there’s yet another take on this: that the Carddas series is an entirely different version of the Rockman X story that’s heavily based on but not related to the games, and that everything therein should be considered its own separate continuity. In this case, the Carddas Rockman X saga ended on a cliffhanger in Mega Mission 3, and it’s unknown if the events of the Xtreme games or X4 onward ever occurred in their universe. That might explain some of the other issues that Mega Mission has with the story, but on that note many fans also don’t feel that the presence of a few minor inconsistencies is enough to merit casting the whole thing out, so to speak. I’ll defer the determination of Carddas’ canonicity to you readers: I’m happy enough just enjoying the artwork. Hope you guys enjoyed Free X Pic Weekend! The next several pages of Rock’n Game Boy will be up on Wednesday, and the final part will be up next week. If you’re sick of those already, at least there’s still Fridays to look forward to. They’re always such a surprise, even I don’t know what I’ll be posting! 6 Comments to "X Pic Weekend Roundup"
For all his crazy weapons, gadgets and fortresses, Sigma must have some very Maverick accountants in his pocket. Especially since he failed to get those Lightanium rods (worth billions in their time)! Club Capcom has Dr. Light on record discussing how classic numbered robots have consciousness, personalities and emotions. On the other hand, X series mechaniloids seem about as soulless cold-hard-programming as robots come. I was glad when Zero called Roll a reploid in Tatsunoko vs Capcom, since she’s so much closer to that in my eyes than to a mechaniloid. Rockman Online seems to be making a similar point about how closely related to reploids the older generation robots sometimes are. Perhaps only someone like Light, or Wily or Alia in Rockman Online really understands the differences between them. To me it seems like the “manufacturing facility” is the entirety of X2 with exclusion of the Counter Hunter base. That way the scene occurs exactly when it’s supposed to; when X defeats the last of the eight bosses and the final battles begin. There may not be a single satisfying answer to this mystery. I’ve been in an X mood lately. Maybe we can get some more clues together soon. Another thing just came to mind. 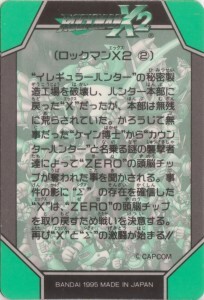 If according to the cards, the Counter Hunters recovered Zero’s control chip, then this is at odds with X5’s portrayal of X2; Zero faced his copy. That’s true, and card 83 showed the black copy Zero as well. That may be part of the reason why some fans are adamant that it’s an error. But Zero could run into his copy on the way to destroy the main computer, after his battle with X. Or X could have recovered Zero’s control chip at some unknown point during the game, like the passage says he set out to do. X5’s opening shows Zero fighting Bit, which might be an X3 manga reference or it might be something that happened off screen. Other unexplained events could have happened off screen also, though in my humble opinion that can get to be a tired excuse for filling in plot holes.